The 19th-seeded ’88-’89 Calgary Flames are now one win away from reaching the Ultimate NHL Final. However, this Game 3 was pretty much a game that the 23rd-seeded ’79-’80 Buffalo Sabres should have won. The Sabres got on the board first when Tony McKegney potted a Mike Vernon rebound for his 11th goal of the tournament. After killing off a Larry Playfair elbowing penalty, Buffalo opened up a 2-0 lead in the first period after Derek Smith scored on yet another Vernon rebound. The first period ended at 2-0 Sabres and Buffalo dominated the period, outshooting Calgary 15-6. It took until just past the nine minute mark in the second period for the Flames to beat Buffalo goaltender Don Edwards when Joe Nieuwendyk scored his 16th goal of the tournament. Despite being outshot 11-6 in the second period, the Flames got their second goal of the period from Hakan Loob with less than two minutes left in the period. However, exactly one minute later, Gary Roberts was called for cross-checking and received a five-minute major, a 10-minute misconduct and a game misconduct, his fourth ejection of the tournament. So the Flames would finish the period killing a five-minute major, but having tied the game up at two. Early in the third, while the Flames were still killing off Roberts’ major, center Joel Otto got called for high-sticking. 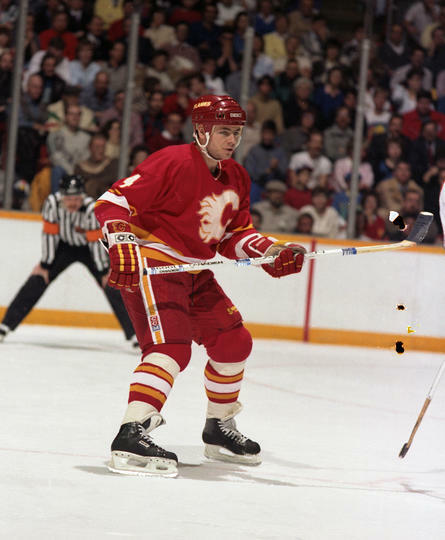 However, in the final minute of Roberts’ major and of the 5-on-3 PP, Calgary defenseman Brad McCrimmon would score the rare 5-on-3 shorthanded goal and just his second goal of the tournament to give the Flames a 3-2 lead after trailing 2-0 at the end of the first period. Calgary would hold that lead and take the 3-0 lead in the series despite being outshot 37-19 in the game. Game 4 will be Tuesday night! Game 4 of the other Semifinal matchup between the top-seeded ’76-’77 Montreal Canadiens and the 4th-seeded ’73-’74 Boston Bruins takes place tomorrow night and the Flames lead the series 2-0! This entry was posted in Semifinal, Ultimate NHL Playoff and tagged Brad McCrimmon, Buffalo Sabres, Calgary Flames, Derek Smith, Don Edwards, Gary Roberts, Hakan Loob, Joe Nieuwendyk, Joel Otto, Larry Playfair, Mike Vernon, Semifinal, Tony McKegney, Ultimate NHL Playoff. Bookmark the permalink.